Lowestoft Sixth Form College is unique! We are the only Sixth Form College in Suffolk and our learning facilities are exceptional. Our students can experience it all. Visit us on our Open Days and see what we have to offer. Call us to book a tour at any point in the year. Atkins, one of the world’s largest architectural firms with design studios across the globe, designed Lowestoft Sixth Form College. Our architect, Richard Christmas has created a dynamic, innovative place to learn. 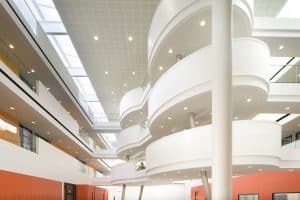 The atrium space with suspended break out Pods, creates a dramatic, central meeting area with access to all four floors. The atrium has full WIFI coverage and has seen some exciting College productions in its vast space. The Pods provide alternative venues for students to learn individually or collaboratively in an inspiring setting. Welcoming cafe with WIFI access. Technology is at the heart of Lowestoft Sixth Form College. We have invested over £1.3 million in the infrastructure and latest equipment. You will experience a high speed internet connection, wireless networking and 24 hour access including the use of College software from home. We welcome you using your own devices at College. We offer many ways for you to use IT: in lessons with laptops and notebooks, in the Learning Resource Centre, in the Pods, in one of our three Mac suites or in our vast open access IT Centre.